Cheshire East Safeguarding Adults Board is made up of a wide range of statutory, independent and voluntary agencies and organisations. Information for professionals including policies, procedures and our Making Safeguarding Personal booklet. Find out what is classed as abuse and how you report suspected abuse or neglect. 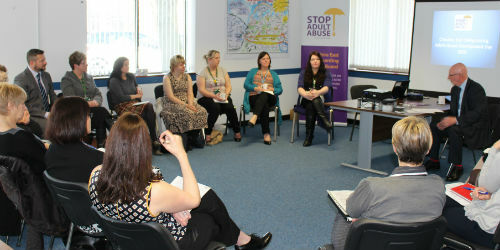 >> Keep up to date with the latest news from Cheshire East Safeguarding Adults Board. CESAB appoint a trainer to work with care providers and the voluntary/third sector. We are pleased to announce that the Board now has a dedicated Trainer to deliver Basic Adult Safeguarding Awareness training to all care providers and third sector partners across Cheshire East. This course is free of charge and will give delegates an understanding of relevant local policies, signs and symptoms, and how to report any concerns. Please email lsab@cheshireeast.gov.uk for more details. The Service User Sub-group of the Cheshire East Safeguarding Adults Board created this spoken word video working with the Axis Arts Centre at Crewe Campus, Manchester Metropolitan University. The spoken words focus on the service users own life experiences and sends a powerful message to Stop Adult Abuse.